LAS VEGAS (AP) Deandre Ayton is having no problem with the competition or the schedule at the NBA level. Ayton outplayed a fellow top rookie big man for the second time, keeping the Phoenix Suns undefeated in preliminary play in Las Vegas. Another full day of basketball Monday, highlighted by Ayton against Orlando’s Mo Bamba in a matchup of unbeaten teams, was the third game in four days for the 20 teams in action at the NBA Summer League. The games are shorter than a regular NBA game – 40 minutes instead of 48 – and there’s no travel, but it’s still a lot of action in a short amount of time. Some teams even gave players a rest day during the stretch of games, knowing there will be more ahead. Every team is guaranteed five games, with the possibility of playing as many as eight games in 12 days. 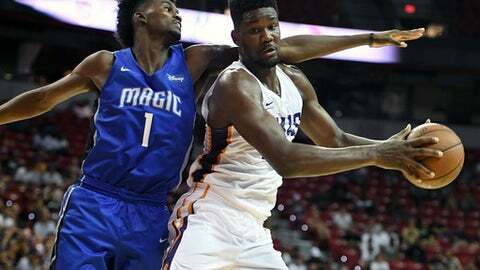 Ayton didn’t look like he needed a break after scoring 17 points and grabbing 13 rebounds in the Suns’ 71-53 victory over the Magic. The No. 1 pick said it was his first victory over Bamba, the No. 6 pick, after he beat fellow high school teammate and No. 2 selection Marvin Bagley III on Saturday. There won’t be any more for Bagley, as the Sacramento Kings announced that an MRI revealed a pelvic bone bruise. The Kings said Bagley would rest for a week or two. Monday was the last of the 10-game slates on the campus of UNLV. There are only five games Tuesday before teams are seeded for tournament play that begins Wednesday. Dragan Bender and Shaquille Harrison each scored 11 points for the Suns (3-0). Davon Reed and Jack Cooley had 10 apiece, while Josh Jackson managed nine after shooting 3 for 13. Bamba had five rebounds and five blocks, but took just four shots and scored four points. Jonathan Issac led the Magic (2-1) with 10 points. Cedi Osman scored 25 points and No. 8 pick Collin Sexton added 21 for the Cavaliers (2-1). Billy Preston finished with 12 points on a day Ante Zizic rested. TJ Leaf scored 20 points for the Pacers (1-2). Alize Johnson added 16, Edmond Sumner had 14 and rookie Aaron Holiday had 12 points and eight assists but also eight turnovers. Rashawn Thomas and PJ Dozier scored 17 points apiece for the Thunder (2-1), who have won two straight games after losing their first 11 games in the Summer League, dating to when the franchise was based in Seattle. Thomas also grabbed 12 rebounds. Kevin Hervey added 12 points and Dakari Johnson finished with 10 while also getting into an exchange with Toronto’s OG Anunoby in which both received technical fouls. Anunoby finished with 19 points and Malachi Richardson had 17 for the Raptors (0-3). Henry Ellenson had 13 points, 10 rebounds and seven assists as Detroit (1-2) avoided going winless in preliminary play. The former lottery pick also had two steals but committed six turnovers. Cheick Diallo scored 25 points in the Pelicans’ first loss in Las Vegas. Walter Lemmon Jr. and Shavon Shields each finished with 14 points for New Orleans (2-1). Troy Brown Jr. scored 23 points and Devin Robinson had 22 to help the Wizards (1-2) win the game matching teams that entered play winless. Furkan Korkmaz, who had a 40-point game earlier this week, was 0 for 9 from the field and finished with one point for the 76ers (0-3). Rookie Zhaire Smith was 1 for 9 for two points. Jabari Bird and Jarrod Uthoff each scored 16 points for the Celtics (2-1). Guerschon Yabusele had 14 points and eight rebounds, and Semi Ojeleye chipped in 13 points and seven boards. Rookie Miles Bridges scored 20 points for the Hornets (2-1). Willy Hernangomez had 17 points and 11 rebounds. Phil Greene scored 16 points in the Mavericks‘ easy victory. Mitchell Creek added 13 points. Dennis Smith Jr. sat out for the Mavericks (2-1) on the day No. 3 pick Luka Doncic signed his contract. Josh Magette and Kendrick Nunn were the only players in double figures with 10 points for the Warriors (1-2), who rested Jordan Bell. Monte Morris led the unbeaten Nuggets (3-0) with 20 points and eight assists. Sterling Brown scored 27 points, going 11 of 18 from the field, for the Bucks (1-2). De’Anthony Melton scored 26 points, making five 3-pointers, to keep the Rockets (3-0) unbeaten. Melton added 10 rebounds and five assists, while Vincent Edwards added 20 points and eight boards. Zhou Qi finished with 12 points, eight rebounds and five blocked shots. Rookie Shai Gilgeous-Alexander had 25 points for the Clippers (1-2), while Vincent Hunter had 20. Sindarius Thornwell was 3 for 13 but scored 13 points. Jared Terrell scored 13 points and rookies Josh Okogie and Keita Bates-Diop each had 11 for the Timberwolves (2-1). Amile Jefferson finished with 12 rebounds and four blocks for Minnesota in a game where both teams shot about 35 percent. Yuta Watanabe and Shawn Dawson each scored 14 points for the winless Nets (0-3). Jarrett Allen grabbed 12 rebounds and blocked five shots.